In the world of sailboat standing rigging there are three common materials used, stainless steel wire, Nitronic 50 rod, and various types of synthetic fibers, which are becoming more and more popular. I want to talk today about Nitronic 50 stainless steel rod. This specific type of stainless steel is very strong and noble. Rod rigging can provide lower stretch, less windage and reduced weight characteristics than its wire counterparts. So if your boat is equipped with rod rigging, what maintenance schedule should one adhere to? In order to maintain your rod rigging or any rigging for that matter, it is highly recommended to simply wash and rinse the hardware with soap and water. This in itself can make a big difference in its longevity. The general guidelines for rod head inspection and service are 40,000 – 60,000 miles or 6 years, whichever comes first. Rods, tangs and fittings, generally should be replaced once the rig exceeds 120,ooo NM. This is a generalization that will vary by geographical region and use. Typically (at least in my experience) one will find that they reach the 6 year mark before the 60,000 miles. The rod head service is extremely important and should not be overlooked. In order to inspect/service your rod the mast will need to be un-stepped. 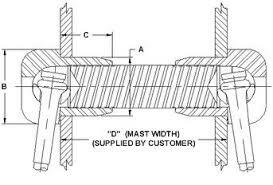 Rod heads are made by a hydraulic cold press machine that utilizes a series of dies, clamps and rams to press a head onto the rod. The rod heads are responsible for keeping the fitting from slipping off. The rods themselves can last a very, very long time. Much longer than the expected life span of wire. This is due primarily to the type of metal used, how it is treated, and also the construction characteristics of the wire vs that of the rod. 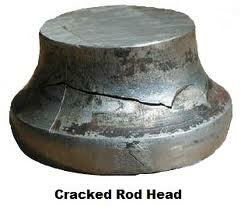 Rod cold heads however, are prone to cracking and should go no longer than 6 years without being serviced. Typically Rod Marine Eyes Get Dimpled! With some type of rod fittings the head can easily be accessed, cleaned up and inspected for cracking. However, other types of fittings will be dimpled to lock the fitting and can therefore not be undone to be inspected. 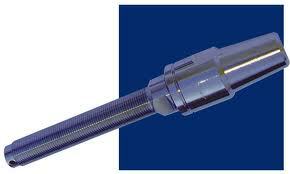 In this case you will need to replace the fitting as well as the head for a satisfactory inspection. This does not necessarily mean the rod needs to be replaced. The length lost will be minimal and is usually within the throw of a turnbuckle. Rod Studs Also Typically are Dimpled! There are instances where the entire rod will need replacing. If the rod has been damaged, bent or kinked, one should replace it. Navtec guidelines talk about it being acceptable to bend the rod back only once if the bend isn’t too severe. Personally, I would get it replaced, because I don’t like ‘if’s’. Another situation that would call for rod replacement, is when a head needs to be replaced aloft on a shroud which utilizes a spreader bend. A spreader bend is an aluminum or stainless sleeve that is slipped onto the rod before heading and is bent in place to a designated angle at the point where the rod intersects the out board spreader end. As there is no turnbuckle at the top end of a stay (at least not typically, that would be weird), the loss of length can not be made up. In other words the spreader angle would no longer be the same. Lastly, you would need to replace any rod that simply does not have enough length for re-heading. This is rare but can happen especially if the rod has been re-headed several times. Regarding terminals, if using a rigging screw type turnbuckle (see picture) make sure your rigger knows to replace the screw itself. These are also very prone to fatigue and aging. A good school of thought here is, any terminals that look extremely old and worn should be replaced. This should be evaluated on a case by case bases. Remember, it is always recommended to seek the advice of a professional. At least at The Rigging Company, advice is always FREE of charge. Read here for more info from Navtec on how to maintain your rig! Have a question or a comment? Just drop us a line below and we will reply. P.S. – If you have these tangs aloft ( old model C&C owners), you should have them checked by your local rigger. Certain older models have been deemed unsafe! – Ask us for details. I know them well, they may also be Loctite-ed. First the shrouds will need to be freed from the spreader ends and spreaders removed. Then you will need LOTS of heat! Heat it until you’re uncomfortable, then keep heating it some more, right when you think it’s gonna melt…use the rod stay itself, articulated into the slot, and use it as a fulcrum. This may bend the rod a bit, but since you are replacing no big deal. Last resort cut the tang with a cut off wheel, not the rod, as the rigger will need the rod whole for measurement. The tangs will also be replaced, exact replacements are likely available. In other words it’s no easy task but heat is likely what will make it move. Good Luck and we hope that helps. Let us know if you need anything else. Remember you can always package and ship it all to our facility and we can set you up with a kit to be sent back to you for you to install. I am looking at changing boats and the one which has caught my eye is an X332 with Rod Rigging. I have no experience of Rod Rigging, and as the boat was built in 2000, am concerned that the cap ends may need inspected and possibly replaced as I have so far been unable to determine if any NDT inspections have been carried out over the years. The boat has been only very lightly used over the past fourteen years by the current owners. What would you suggest should be done to determine the state of the rigging and what is the likely cost. The boat is based in the west of Scotland. Thanks for commenting. If you are unsure, have the rod ends replaced. This may mean that some rods get replaced but not necessarily all of them, unless the boat has been sailed for significant miles, 60,000 or so (it doesn’t sound like it). You will need to find a rod rigging service center, have the mast unstepped, and replace all of the heads and the fittings at a minimum. If you cannot find someone close by you can always have the mast unstepped and then coil the rigging and ship it to us for service. Once completed we can ship it back. The furler will need to be the item of discussion, but we can work that out. It would be my hypothesis that the cost for this can range anywhere between $3500 to $6000 (give or take a $1000) depending on what needs to be done. Shipping would be additional. Once we receive everything we can provide a detailed quote outlining all of the tasks and parts and give you a more concrete number. They are a BSI rod dealer last we checked and they seemed very responsive. Let us know if this helps and good luck with everything. i have a X Yacht 50 Launched 2008 with a Navtec carbon mast . Due to aluminium corrosion I have a problem removing two stainless steel plates in which the rod head is fixed in . Unless I manage to remove the end bit of the coroded Aluminium spreader which is sandwich between the stainles plates which in turn are connected by a thread I have to replace my rods unless an alternative end cap sytem can be adopted provided the rod heads are ok . I have a picture but unable to attche it . Send a copy of this note along with a picture to sales@theriggingco.com and we’ll put our heads together on this. Thanks for reaching out to us. Welding repair the rod head? The short answer here is no. The heat from the weld would cause a weak point in the rod. What a great website for a newbie owner of a rod rigged boat. Mine is a 1980 Niagara 35 with the original rod rigging. We are refitting and replacing just about everything else to go cruising south, from what I’ve read there is no point inspecting the rod rig so I want to replace with wire – easier to fix and replace where we are going. Can you recommend a solution and replacement hardware for fixing new wire shrouds for the mast uppers and lowers? Thanks! Thanks for the compliment. Although wire replacement is possible, we recommend just servicing the rod. The cost associated with this is very likely less than wire conversion anyways and it is a better performing, longer lasting product. Simply fill out our Work Request Form, and coil, package, and send us (or drop off) the rods for service. Once we received the package we will make an estimate for the required items free of charge. Once you approve the work, the turn around time is likely about 2 weeks until we are ready to ship. I have rod rigging on my 1982 islanders 40 , it’s been inspected and it is in good shape and I’m thinking of trucking the boat to a new port which would involve removing the mast. I am concerned about not damaging the rod rigging during removal and transit, any advice would be greatly appreciated. Thanks! I own in last the 3 years a C&C 42 Landfall 1978 model with rod rigging. Should it be looked at before i sail to far off regions. The answer is very likely yes, especially if you are under the impression that it has been done in the last 6 years. I have a compression fitting as shown for the uppers on my Cal 2-46 done in 1989. what types of problems have been found and what solutions are available? The fitting is prone to corrosion issues at the threaded tube. The tube is aluminum and is also susceptible to being cut in half by the old stainless steel wire halyards (which then also chafes the newer rope halyards too). Then the older generations all used round balls for the rod head to seat in (inside the tang) which created a hard spot where the rod where it exits the ball and was known to cause rod failure. They later changed these tangs to a similar design with different rod seat called a tapered stemball. There are replacements readily available through <a href=”http://www.bsidk.com/rigging/rod-rigging” target=”_blank”>BSI</a> and The Rigging Company. You will need to rehead stays and this means any stays with spreader bends will need to be replaced all together. Thanks for the comment. For more information please don’t hesitate to contact one of our sales staff at 443-847-1004. What is the solution with Navtec now gone? Can I source Nitronic 50 and have the various rods made to length and threaded?? Can I trust the nitronic 50 buying it straight from supplier of rod? Is Navtec France still in play, can BSi produce the rod? Can I buy and trust the Nitronic 50 from a manufacturer and go the long haul to make up the new rod? Should I convert to Synthetic? What are my options? The solution and cost of any changes will be the difference from saving a grand old girl, or not. Rod and all fittings necessary can certainly be sourced. BSI is a great place to start. I think Navtec globally is finished, their parts have been liquidated to various other manufacturers. Hayn, Rig Rite and another company that escapes me right now did most of the acquisition. We are dealers for all of the above and can therefore certainly be of more help. Please email jimmie@theriggingco.com for more information or give us a call at 443-847-1004. Synthetics are also an option, but I’d need to know more about the grand old girl before I can recommend one thing or another. Thank you for your article with info about rod rigging… I have been sailing around the world on a Southern Cross 35 with rod rigging since 2009. Following Navtec guidelines since departure has kept the mast up all these years but I would sleep better at nigh knowing that I can jury rig something to hold the mast up and keep sailing (at least safely to my next port) if one of my rod fails in the middle of an ocean passage. In your opinion, could a 6mm Dyneema SK75 temporarily replace a Nitronic 50 number #10 rod that has a breaking strength of 10 000lbs ? I think this is a great idea…we even make what is called a Spare Stay Kit here at TRC. It is basically as you describe, but with a very nice Handy Lock, tool-less, turnbuckle, and a few other nick-knacks for blown out tangs and/or chainplates. So if the rig is still up, and you can make it up the mast for a fix, I’d say there is no better option. Just check your breaking strength and be sure that you are running a stronger than the rod synthetic, it could even be Vectran (less elongation for long runs). Keep in mind as you bend the line, i.e. truckers hitch or other knot, you greatly reduce the strength (to be fair everything is typically overbuilt to ensure certain safety factors) so the stronger the better. Thank you for your article with info about rod rigging. Just purchased a 1988 C&C 41 with rod rigging and during our first sail the intermediate shroud slipped suddenly about ¾ of and inch on the threads! Do you know if the stainless steel used is typically significantly harder than the bronze of the threaded rod? I am hoping that is the case and that I can simply replace that threaded rod and not the entire stainless shroud. Thoughts? The theory of the bronze and the stainless is that the stainless will give way to the bronze. This preventing thread galling. However in your case if the threads have slipped already I would avoid all uncertainty by replacing the entire turnbuckle. I would additionally see my local rigger about replacing all of threaded rods with new ones as well as talk about reheading the rods if that hasn’t been done yet? Lastly, the age of the boat makes me think about the through-deck chainplates. Have they ever been pulled and properly inspected? Same goes for the shroud mast tangs. Just some thoughts and thanks for asking. First, thanks for the explanation of rod rigging, service limits and repair. 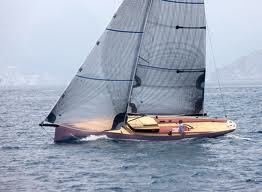 I am looking at buying a Morgan 454 and all of the ones I am looking at has not had the rod rigging replaced. As a result of reading your article, I have asked the brokers if there were inspections and replacement of rod heads. Is there an age limit or just the 120,000 NM limit? Also what would be a ballpark figure for replacing the rod rigging in a Morgan 454? Thanks for reading and the kind words. We are glad you find this info helpful. Rod rigging, unlike wire, has no set time limit, just mileage. Having said that the rigging does experience mileage just by sitting at the dock or on the hard, this they call cycle loading. Although it takes a REALLY long time for this to make the mileage requirements, it is possible. A very old boat that has been sailed hard for many miles and then stored on land, or in water, for an exceptionally long period, could make all of the mileage add up. So in this scenario complete rod replacement is recommended. To answer your question on cost; complete rod replacement for a boat like this could run around $7500 here at TRC (you can easily give or take thousands if not careful, i.e. $5500 – $9500). You will also need to think about taking the mast down and back up, add $2k (for rough numbers sake). A rod service (not complete replacement, but re-head all stays, replace fittings and rods on case-by-case basis) may run around $3500-$5500, plus taking the mast down and back up. So either way I would say…prepare yourself for a bill as low as $5k or as high as $12k, let’s just call it $10k. These are very rough numbers, but I have enough experience that I can speak loosely to the cost of things for this type of boat. My understanding is that Navtec is going or is all ready out of business. Where can I purchase replacement rod rigging for an aging lagre boat? That is my understanding too. All of our rod products are now <a href=”http://www.bsidk.com/rigging”>BSI of Denmark</a>. You can purchase them directly from us or ask us any questions we’d be glad to help. Thanks for choosing TRC for your sailboat questions, and please don’t hesitate to <a href=”http://theriggingco.com/fill-out-our-online-work-request-form/”>contact us</a> for more information, or more questions. Hello, I own a Beneteau First 40.7 year 2000 and I would like to know if I must change the rods. As I will go up the Atlantic coast, where can I do the appropriate service? Full replacement is likely not necessary with rod rigging. Unless the boat traveled more than 120,000 NM. 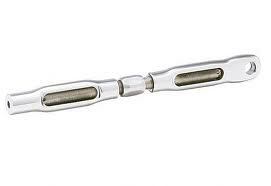 However the rod heads need to be replaced on all of the rods and fittings need to be serviced and inspected. Having said all of that, based on site unseen, you will likely need spend around $7k-$10k for a rod service. This includes unstepping, re-heading all rods, and stepping, complete with tune and everything ready to install sails. Full rod replacement may run around $10k-$15k including step and unstep. If you give us rod diameters of the various stays and some pictures we could come up with some more defined numbers. Also, let us know where on the east coast you are so that we can provide a good recommendation for where to take your boat. Hi. I have just bought a second hand forestay furler. I need to shorten it to fit my boat.. I have already cut the ‘head end’ to start to shorten it. is there any other sort of head bearing other than the cold pressed head you describe ?. Yes, the bearing is part of the fitting. What type of fitting do you require? Eye, eye toggle, jaw toggle? i have the same cap tang from BSI . What is the problem with it ? Nothing, the BSI version is fine as far as I know. So is the newer version of this Navtec tang. It is this style tang, made by Navtec on older boats that have the problem. The through tube was aluminum and therefore corroded to the caps. It was susceptible to failure. Especially if the boat was ever equipped with wire halyards. Think….hack saw. Hi, C&C 34, 1979. Apparently original rod rigging. The tangs looks exactly like the ones you mentioned in “PS” section at the bottom of the article. All but one tangs do have a ball inside the tangs moving freely, the one for the inner left shroud appears frozen. Did try PB blaster to no help. Do you have a cut-through diagram of how this tang is made? Any suggestion on how to unfreeze the ball. 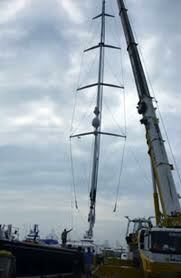 The mast is currently unstepped laying sideways, could that be affecting the motion of the ball on the top side? Why are those tangs unsafe? Thanks for checking us out. Those tangs are threaded onto a threaded tube. You need to use the shroud itself, uncaptivated by the spreader, in against the mast and into the slot where the stay goes into the tang. Then use the stays as the fulcrum in opposing directions to wrench them off…..HEAT REQUIRED (I recommend a good MAP gas torch). Should be lefty-loosy, righty-tighty. Here is a diagram of the tang. This thing might be a bear, but stick with it and get it REAL hot (I mean within reason:-0)). You will likely need to upgrade to the newer version anyways. In-case you have to cut it out!!! The problem with the old ones were that the wire halyards would saw through them. Besides that they used aluminum tubes with stainless caps, corrosion nightmare (hence what I said before about cutting them). Here is a likely replacement that will be much better. Can the cold pressed heads be safely replaced with swaged heads ? Hope that helps and thanks for the help. Is there anything in particular to do with the rod on the ’79 Landfall 42 that I should look out for beyond what you’ve said here ? Hello, Just make sure that the rod has been properly serviced. This means the mast needs to be unstepped, the rod heads re-headed, then re-stepped. Unless this has been done recently. Certain rods and fitting will need replacement just due to the nature of re-heading. Be sure to contact your local rigging shop that can perform rod services for more information. How would one pack rod rigging for shipping to you for inspection and repair? Navtec says the minimum diameter for coiling is 200 x rod diameter, which means at least a 75″ x 75″ box for 3/8 and around 68 x 68 for 5/16. (the vessel is a Shannon 39). Although I have heard of this guideline, I have yet to actually use it myself, ha. This sounds like a very loose guideline. It also depends on how long the rod is. To be honest we do it by feel. We will usually twist in the first coil and then pull it until it starts feeling tight (but not forced, or too tight). I will then secure the coil with the short end via a twist. I then roll the coil until the twisted end begins to work its way out and then I twist it around the coil again (sometimes two times depending how much is sticking out). After the third twist I will make a bundle of tape at the loose end to secure it to the coil. Then I continue to roll the coil until I have the other end…again with three twists and a bundle of tape I secure it. Careful as loaded rod coils can cause injury!!! I have a piece of in the shop that is around 3/8″ now and the hoop diameter is approx. 60″. This is actually a bit of a sloppy coil so I think I could make it even tighter as it was done by the customer. It is an upper shroud off of a Sabre 42….just FYI. Please use our Online Work Request Form (or something like it in the package) so that we have all of your info. MAke sure you label the stays well and also (if you have not unstepped the mast yet) mark the threads on the turnbuckles where they intersect the threads. Regards and we look forward to working with you. Hi guys, I have one of these tangs on my 1983 CS 33. The boat currently has rod rigging but I am converting over to wire. I don’t race the boat and it is easier to service wire rigging locally. Do you know of a fitting that would replace this tang with one I could use with wire? Any help or thoughts would be appreciated. Thanks for the comment, hope this helps. Let us know if you need anything else and how things turn out. P.S. – NOTE: stay lengths and bearing points will likely be affected!!! I have a 1979 C&C 36 with original rigging that needs replacement. I cut off the head of the main shroud fitting near the spreader and it did not slide out of the mast. Do I drill out the center of the aluminum post? I’m sorry I am not sure of the question? I’m contemplating the purchase of a 1980 C&C Landfall 38 and the current owner has told me that the rod rigging is “original”(!?!) – That would put it in the neighborhood of 35 service years! Is the Landfall one of the C&C models you alluded to above? Does this mean all rod & fittings will need to be replaced first thing? What kind of expense would I be facing to replace all the rod and accompanying fittings? Is there a more economical solution for replacing the rod rigging? Thank you for your time and consideration – I love your website! Thanks for the kind words Angus. The C&C is a great boat. I have one myself! I am not sure if this model will require the new tangs, but there is a very good chance. It would be best if I could look at it. Is the boat local to us in Annapolis, MD? In terms of how much money this could cost, it could be anywhere from $5k on the low end and $10k on the big end….so let’s call it $7500 for the sake of throwing around loose numbers. I can help create something more accurate by looking at it, or some pictures and measurements from you will suffice as well. Just let me know when the time comes. Rod heads for Nitronic 50 are cold forged at the factory. Can they be heat forged on site? The boat has moved from the coast to a small lake. Hi Ray, thanks for asking. I have never heard of heat froging rod heads. You would simply have to remove the rod, package it and ship it to us or any rod service location. We would cold press the new heads and mail the rods back once finished. Hi Doug, thanks for the comment. Navtec makes a direct replacement for this tang, if you were to stay with rod. Ultimately it depends on the size of the hole left behind. BUT if I were going to wire I might try to reshape the existing hole in the emast to accommodate the K200 tang by Navtec…http://www.lewmar.com/products.asp?id=8644&type=85&channel=1. Hope that helps, thanks for the read,and let us know if we can help you further. These tangs can be very difficult to remove. You should know that these tangs are threaded caps which hold the rod and stem ball captive. These caps are then threaded onto threaded tubes. First, you’ll need to unstep the mast. Situate the mast in such a fashion that it can sit track up or front side facing up. This way you can access both sides of the tangs. Then take the spreaders off. Next heat the tang with a torch and make sure it is REAL REAL hot. Then fold the rod in alongside the mast in such a fashion so that it is laying in the groove of the tang. Now, using the rod as a fulcrum, with you on one side and another helper on the opposing rod try and break it free so that you can unthread it. This may feel really tough (it may be really easy too). Grab the rod as short as possible when wrenching it. Nitronic 50 rod is a lot less susceptible to bending than you might think. Beyond that….if the tang’s caps don’t want to break free you may need to go ahead and buy the replacements and cut out the old tangs!…. Once the tang can spin freely, align the rod so that it is perpendicular to the groove, or 90 degrees to tang cap, and continue to unspin the tang all the way off. Note: You should have to perform several revolutions before they will unthread completely. I know this seems like more than what you may have bargained for, but this is how I’d do it. …hope that helps. Let us know how you did.